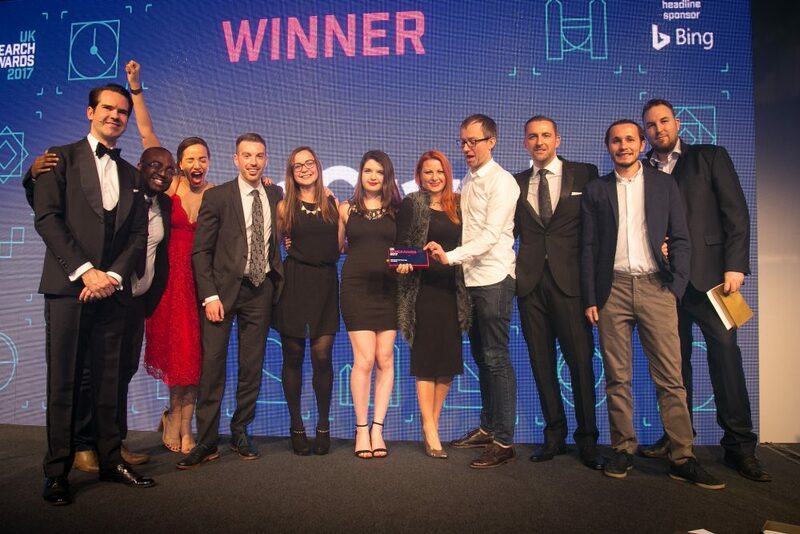 On Thursday 30th November 2017, the DeepCrawl team put our glad rags on and headed to The Ballroom South Bank for the prestigious UK Search Awards. Set under a dazzling canopy of lights, surrounded by search marketers at the top of their game, and hosted by comedic household name Jimmy Carr, we were in for a real treat of an evening. DeepCrawl had been nominated for Best Search Software Tool, and we were beyond delighted when it was announced that we had won. For the final award, the expert judges had been tasked with finding an individual who leads the way and revolutionises the Search industry, as well as inspiring the future. 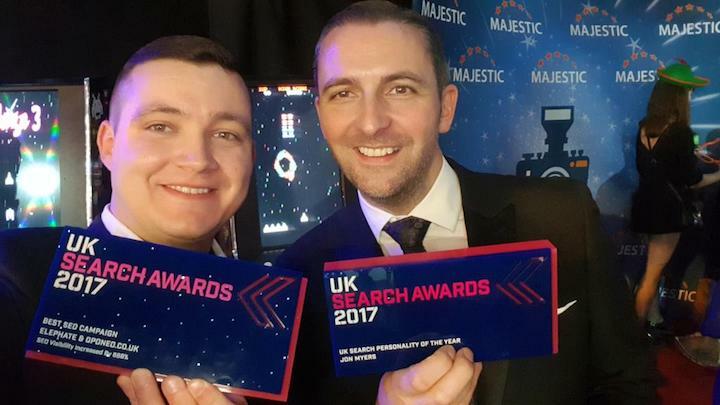 This year that honour was bestowed upon our very own Jon Myers, who was named UK Search Personality of the Year 2017. Jon. The UK Search Personality of the Year 2017! Even though the competition is tough every year, since now those #OscarliciousAwards have been going for 7 years, I had no doubts that this award goes to Jon. We all have ups and downs in our short given life and even a UK Search Personality of the Year, too. Therefore it is even more important to point out Jon’s path, which he has taken over the last several years. I’m sure he will achieve more outstanding moments in our industry after those fabulous #UKSearchAwards 2017. I’m proud to call him a friend and see his face in the hall of fame, words cannot describe. For sure more than one #Wingshot will come up, more than a bull he will ride and more places we will find to have a good beer together. Last Thursday was your #ThumbUpBeerDay, congratulation Jon! I am often skeptical of awards — how they’re won, who’s considered, what criteria go into them. But by any measure, Jon Myers has earned this recognition 100X over. In my opinion, his win improves the reputation of the award itself and the organization behind it. Mazel tov to a great friend and a great man. I can’t remember exactly when and where I met Jon for the first time, but I know that it was over a decade ago. His guidance, advice and friendship have helped me out repeatedly ever since. I vividly remember him moderating a panel I spoke on early in my career that shaped how I’ve approached panel speaking ever since. I remember his simple advice – always to know in advance what angles the other speakers were taking and how my talking points fit into the mix. For a nervous speaker early in my career, Jon’s calming influence was huge, and I’m sure there are dozens, if not hundreds, of now-successful individuals who have similar stories. He’s been so generous with his time and expertise throughout my career in Search – and so I’m dead proud of his Search Personality of the Year award. Well done Jon, and congratulations. Jon is simply one-of-a-kind, so giving him an award for UK Search Personality of the Year seems like a no-brainer. Why did it take so long? He’s as bright as day and as smooth as glass, and I’m happy to have gotten to know him in some small ways over the past years. Jon is hard working, whip-smart, and always ready with a helping hand for someone in need. I’d be remiss if I didn’t also note my appreciation for Jon’s inimitable style—man, that guy can wear a suit! (Jon, I’d like you to introduce me to your tailor). Congratulations! Choosing Jon for UK Search Personality of the Year was a no-brainer. The judges easily reached consensus. As for me, an American judge, please know that Jon is a true ambassador to the United States, and is ubiquitous on our side of the pond. He represents UK marketers with distinction, character, social grace and intellectual prowess. Jon, congratulations from Aimclear and America. #Winning! This award is long-due as I can’t think of anyone who would deserve it more than Jon. He’s not only one of the best and well-known professionals in the UK search industry, but also one of the friendliest and easy going people, always looking to help and contribute. I’m very happy he has received this well-deserved recognition. I was delighted when the announcement came that it was Jon Myers who was the new Search Personality of the Year. I’ve known Jon a number of years now and he’s been incredibly supportive of me as a CAB member, and previously as a fellow industry member. Jon’s vast experience has led to Jon’s extreme knowledge when it comes to the area of Search. He’s always a pioneer for the next stages of the industry as they emerge. However, his knowledge does not deter his humility. There’s not a more down to earth ‘Northerner’ you’ll find than Jon, I’m very pleased to say. Well done. Richly deserved and I’m honoured to be part of your CAB. Onwards and upwards in 2018 to many more great achievements. I honestly can’t think of a worthier winner of this award than Jon! He has played a huge part in this industry for a long while, always finding time to give back along the way. You can find Jon at any industry event sharing his wealth of experience, offering advice and providing encouragement to peers and newcomers alike. He’s a truly genuine person with both patience and passion by the bucket load, and far too humble to have ever seen this coming! I can’t imagine somebody who deserves the Search Personality of the Year award more than Jon. We all know that Jon is a great expert, but what is most important is that he is one of the most humble and friendly guys in the industry. Jon – you rock! Congrats and I wish you even more success in 2018! Jon is always someone that gives 150% when it comes to the Search industry, the amount of time he dedicates to sharing and inspiring people around SEO is amazing. It was really wonderful to hear about him being recognised by his UK peers at the UK Search Awards. It’s also been great to see all the positive energy spreading among the DeepCrawl team who have become technology leaders in the Search space over the last few years. Jon Myers has had an exceptional career to date, helping to shape the service offerings as the sector developed, ultimately being recruited by Yahoo! to head up their search business and display management. He then changed tack to product, taking Marin Software through their IPO and now, in his current role, developing DeepCrawl as an industry-leading toolset. Jon is someone who cares passionately about digital marketing. This is clearly evident by his conference talks and moderation. Although he’s been holding senior management positions for years, he doesn’t skip a beat when it comes to the details of search marketing in 2017. Maintaining that level of subject-matter expertise over two decades is not a job, but a vocation. The industry is lucky to have him. Our friendly England v Ireland rugby rivalry is one of the few areas where Jon and I have differing opinions. 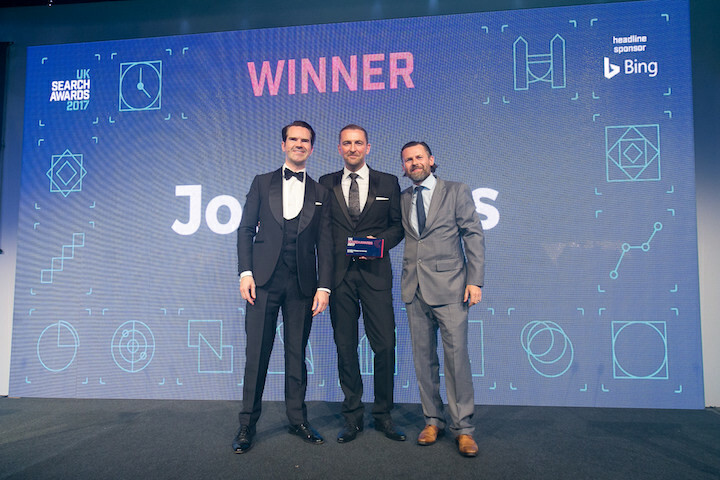 One of the nicest guys you’ll ever meet and one of the sharpest minds in Search, Jon’s been one of the UK search industry’s leading lights for so long this award is long overdue. Your award-winning did not surprise me because I already knew that you are a fabulous person. Jon, congratulations on being awarded Search Personality of the Year! This leaves no doubt that you are the best we have. No one is more deserving. It’s your hard work and dedication which makes you stand out, and your out-of-the-box thinking and ideas are fabulous and help the whole industry grow. From Agency to Search Engine Ad man to senior leadership in the software space, there is not a more rounded skill set in the industry, and if anyone was going to win the award (other than me of course! ), it should be Jon. From our first meeting (sometime around 2006-07), with me – a cocky sole trader with big aspirations and him – the ‘director of search’ at Latitude, to the last meeting we had – drinking shots from the DeepCrawl Vodka luge – Jon has always been someone I am happy to listen to and take onboard his experience and wisdom. Well done mate – beers are on me when I see you next! I was delighted to see recognition for all the work that Jon has done over the years. He’s continued to reinvent himself every so often and the consistent theme has always been the commitment he brings to whatever role he is doing. Thoroughly deserved award and I was honoured as a judge to have been involved in the discussion when we threw around the potential candidates for 2017, and Jon was a stand out choice. His longevity in the industry will continue to inspire newcomers into the industry that we both have such a great love for. Having worked with the founding team and DeepCrawl since its very start, as well as watching and meeting with Jon over the last decade, I can attest and be very proud to say we have been firsthand to all of Jon’s achievements – recently and going back over the last decade – and look forward to what the future holds for one of the UK’s most recognised and standout individuals for our industry. Jon is a good example of how commitment and hard work pay off. If there’s anyone you can believe about SEO it’s Jon. Jon is extremely knowledgeable in the Search Engine Optimisation (SEO) and digital marketing fields and seems to have endless knowledge of the latest trends and developments. This award is well-deserved. I can’t remember when I first met Jon, he has always been such a stalwart of the industry. Nobody is a more deserving winner of this award. A hero amongst crawls! Jon isn’t just a great industry leader who has been at the top in both innovation and strategy in Search. He is also a top guy and I consider him a good friend. I’m looking forward to the future and where he takes DeepCrawl in the coming years. #wingshot! 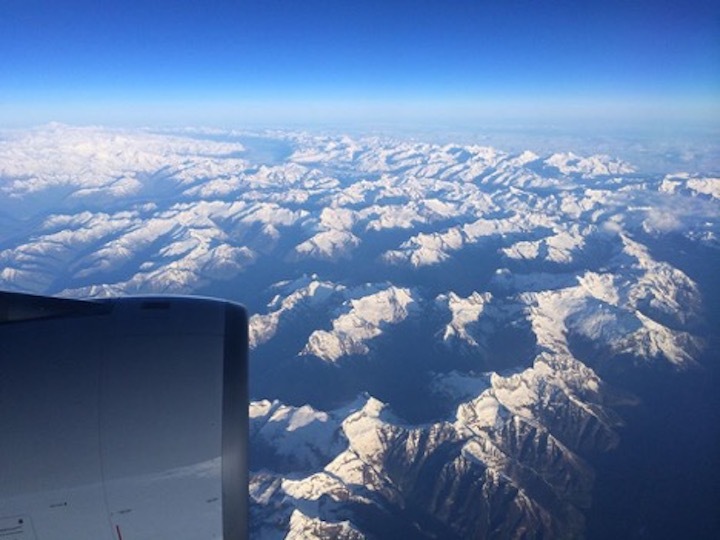 #WingShot for Mister Search Personality himself. Jon has helped Search Planet with a variety of business needs. He has a strong understanding of SEO and has long been recognized for his contributions to the industry. I am impressed by his balanced approach to SEO and how enjoyable he is to work with. Jon is a positive people person constantly supporting and motivating people around him. A well-deserved winner! Knowing Jon Myers for nearly twenty years, I’m surprised it’s taken this long for him to receive an industry gong like this! But all good things come to those who wait, so we at Delightful Communications say jolly well done Mr. Myers! You’ve been a constant source of knowledge and expertise in Search globally, always willing to give some advice or to listen and learn where warranted as well. You’ve been an inspiration to many and long may your legacy and #WingShot fetish continue! I have known Jon for close to 10 years now and seen him develop as a professional in a fast-changing world – Jon is one of the anchors in the industry and has been a steady stream of knowledge through the years. Jon is one of the few people I know that keeps reinventing himself, being in the forefront of technology and innovation. He is one of those that I look to as an inspiration. Jon’s a legend in Search and certainly was a huge encouragement in getting BrightonSEO to the scale it is now. A calm and experienced head who’s a natural with the moderator’s microphone in his hand! I’ve known Jon for almost a decade now and I keep being amazed by his kindness. He’s a professional in everything he does, and at the same time he has this ‘friend next door’ vibe that makes him loveable to so many people in the industry. Jon being voted UK Search Personality of the Year was long overdue. A recognition for not just what he did last year, but what’s he’s done for the industry over the past decade. Well done mate! Enjoy this proud moment! I met Jon at SMXL in Milan, Italy and was blown away by the depth of his Technical SEO expertise. I was particularly humbled by his poise and willingness to teach people with patience and make the complicated easy, even for those such as me who are well-versed in SEO! Jon has been providing insight in to Search for as long as I have been in the industry and continues to help drive us all forward while remaining a genuinely nice guy. A well deserved and long overdue recognition. Jon Myers has been contributing to the Search industry for almost two decades. I am so happy that he was recognized as UK Search Personality of the Year at the UK Search Awards. Kudos to an outstanding search marketer and even better gentleman. I couldn’t be happier and more excited for Jon to win the UK Search Personality of the Year award. Jon is a true veteran of Search and he’s always seeking to better the industry as a whole in all his endeavors, especially with DeepCrawl. Thank you, Jon, for all that you do and I look forward to raising a toast to you in person the next time we’re in the same city. Jon is not only a sharp guy who knows his stuff, but he also has a personality of gold. Always there, always contributing and making our time in the industry fun. Jon is an amazing person amongst other things. He also introduced me to the SEO #wingshot challenge which showed me how international the SEO community is. And it’s great fun. Apart from that Jon is an awesome person to have around. Love our chats and just having fun! Couldn’t happen to a nicer guy, Jon, you’re always a pleasure to spend time with. I always learn a lot about how the industry works from you, its history and who to speak to about whatever problems. Also, as you’re a motorsport fan you get extra points in the top bloke stakes. Congratulations mate! I’ve known Jon for around a decade. He is one of the nicest, sweetest guys in the industry. My family and I were lucky enough to have him come visit us in NC and then we went to France with his family. He’s brilliant professionally, but the best thing about him is that he’s just a really amazing human being. This honor is very, very well deserved and I look forward to seeing what other successes come his way. Jon has been a well-respected thought leader since I started in the industry back in 2006. His experience and achievements speak for themselves. He has a reputation for building and motivating great teams and everyone who knows him has nothing but positive things to say. I have known Jon for a long time from afar around the digital marketing and search marketing landscape. Although I have never worked with him directly, he has always been a BIG personality and seemingly knows everyone there is to know. I have been lucky enough to watch Jon present talks at a number of conferences over the years and have always admired his in-depth knowledge, opinion and take on how the industry is shaping up. To hear that Jon won the Search Personality of the Year award is more than well-deserved. Best of luck for the future, Jon! Jon has probably acted as a coach and mentor to over half the industry – myself included. He was the moderator when Sam Noble and I gave our first conference talks in 2013 and I will be forever grateful to him for how supportive and helpful he was to us both. In addition, he’s incredibly knowledgeable and friendly – with his wealth of experience spanning his career at search engines, tech companies and agencies, he’s a real asset to the search industry and I’m thrilled to see his contributions recognised by him winning this award! I had the pleasure of working with Jon whilst at Latitude in the early days of Search – in the early noughties. Jon’s contribution, involvement and promotion of our industry will not easily be exceeded by one individual. He deserves the accolades and I look forward to seeing his experience and expertise help continue to grow our industry in the future. Congratulations mate. Congratulations Jon on winning the award, people don’t realise the time and effort that goes into travelling and talking at events, it’s not as easy as it looks and the award has gone to one hell of a nice guy too. Congratulations on the Search Personality of the Year award, Jon! I’m not sure if it’s the cult of #Wingshots you’ve inspired, your tolerance of Jennifer, or simply your ability to understand what I’m saying that impressed the judges. Either way, keep up the good work! Jon has been such an inspiration and positive influence on the search industry for many years and for many years to come. The award is well deserved and it really couldn’t go to a nicer guy. I’ve known Jon for many years, and he has always been highly regarded in the industry, so I can’t think of anyone more deserving to win the UK Search Personality of the Year award. When I saw on Twitter that Jon had won the Search Personality of the Year award I was so happy for him. I couldn’t think of a more deserving winner; it’s been a long time coming! Jon has been in the industry for years and I am sure that I speak for a lot of people when I say that he has helped us all a great deal. Since meeting him back at SES London in 2011, we have attended and spoken at a lot of other conferences together across the globe. Not only is he an incredible industry professional, he is also a great friend. Massive congrats, Jon. So pleased for you!! I was so overjoyed when I learned that Jon had been given the incredibly prestigious honour of being named UK Search Personality of the Year. Congratulations, Jon! As someone who strongly supports the wonderfully inclusive and sharing nature of our industry, I think that Jon is one of the single-best custodians of this. He has been part of the industry since I started out, and his dedication and approachable and utterly helpful nature have been apparent throughout. Not only this, but his continued contribution with everything from: presentations, MC-ing, speaking and sharing knowledge is second to none across the industry. I’m very glad that I can call him a friend. Congrats, Jon, hugely well-deserved accolade! Jon, personally I think everyone has been too positive on this page. Let’s not let this achievement go to your head. I mean sure, you’re a great bloke with tonnes of industry knowledge (some would call you an industry leader), and judging by the comments you are loved throughout the whole of the digital marketing sector both SEO & PPC. And who doesn’t love #wingshot – well, the DeepCrawl intern you make login to your Twitter every twenty minutes to check the hashtag – but apart from that nobody. Very well deserved, Jon! We are really excited to have such a huge industry leader advising for us on the Search Elite Conference. It’s been a pleasure working with you for many years! Jon is one of those people who makes this industry so fabulous, Search Personality of the Year is well-deserved and long overdue. Knowledge and know-how are one thing in Search, but personality makes it real and accessible for others… and of course the importance of the #wingshot! Jon has been an active resource in our industry for many years. He has shared his knowledge with many of us selflessly. It is great to see the industry recognise this. Great to see Jon get this! With his long-standing career in Search combined with the fact he seems to know and be well-respected by everyone in the industry, Jon was an easy choice for this award, despite there being some great people nominated. I haven’t know him that long, however he’s always been welcoming, friendly and great to talk to wherever I bump into him – a true personality of our industry! I can only echo what others have said – Jon is one of the most decent, honest, hardworking, supportive, level-headed and enthusiastic guys in the search industry. I lobbied for this well-deserved win and I’m so glad the judges agreed! 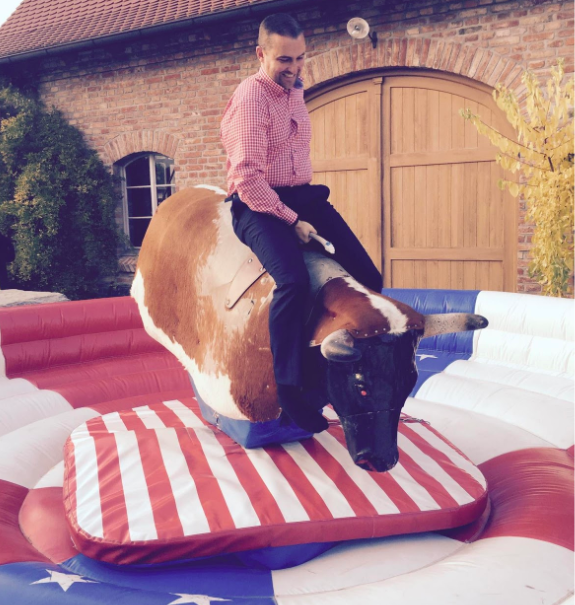 Finally, here’s what our CEO, Michal Magdziarz had to say about Jon receiving the award. There aren’t many people who would be able to influence so many in such a subtle way. Jon combines in-depth SEO knowledge and industry expertise with exceptional leadership skills and multidisciplinary experience, starting from marketing through to account management, and ending with sales. Not only has he given courage to the company, but also to every single one of us who have had the opportunity to work with him. 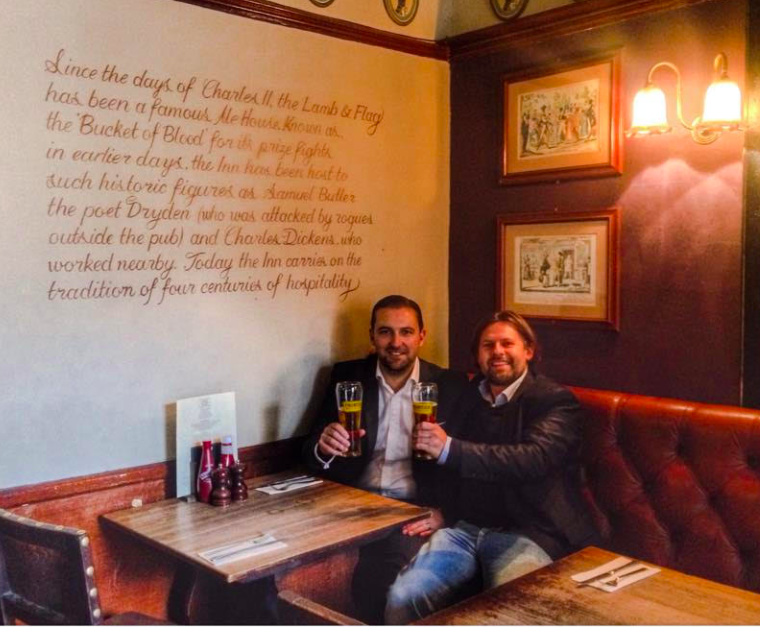 I cannot express enough the impact Jon has had on the success of DeepCrawl in last 11 months. Congratulations, Jon and a big thank you from all of us for all you have done for the Search industry! We’d also like to congratulate all of the winners and nominees at the UK Search Awards this year. It was an incredible event and it was an honour to be surrounded by the sharpest minds in Search.